Organ Of Corti smashed their way through to the BurySOUND final with their barnstorming set at Heat 1 of the competition. The trio were announced as winners of the night, after sets from soloists Ben Wheatley and Noah Evans, Cambridge’s Deep City and BSE’s Enterlude. Ben Wheatley, from Thetford, kicked off the night with his acoustics, and he was really rather good at it. The tracks Trigger and Love Game were great highlights from his set, especially to differentiate from the more slower numbers like Gentlemen. Ben is hoping to be releasing his debut EP soon, and hopefully he’ll be back at The Hunter Club in the near future! Cambridge indie pop foursome Deep City were up next. Having seen them before at The Apex and also having listened to their latest EP 15:16 religiously, I was excited to hear them on a smaller stage. There’s no denying that the band have a great presence on stage and a great selection of tracks to perform, especially the insanely good Time and Slow. All this helped by the use of a loop pedal which really shows off the band’s talents. 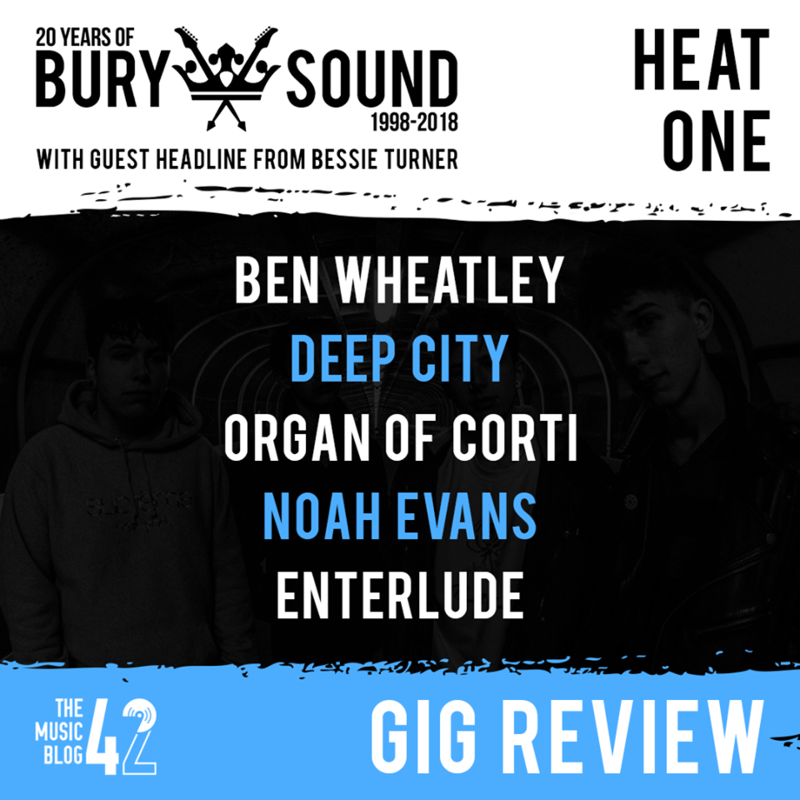 One of the newest bands on the Bury scene were up next in Organ of Corti. The trio really took me by surprise, mainly due to the fact I’m not really a fan of the type of music they make but I was completely hooked from the first song. All three members of the group looked in their element, and their vocalist has such a great voice. I seriously can’t wait to see them on a bigger stage, hopefully, they’ll sound even better. One of the youngest entries in the competition this year was 13 year old Noah Evans. As soon as he took to the stage, the packed crowd were hooked with his impressive, mature songwriting. His interaction with the crowd was very admirable, getting them to sing-a-long with his covers of tracks like Sweet Child O’ Mine and Naive. His EP is out soon and we can’t wait to listen to it! The last act on were alt-rock quintet Enterlude. The crowd were definitely up for this set, the whole place was moving to their great tracks like Hurt Yourself and British Dream, made even better with the use of a synthesiser, which gave their music more of a layered sound to it. If you’re a fan of Miles Kane and 80’s synth pop, you’ll love these lot. It’d be great to see them again! After the rather heated voting process (described by one as being like Brexit! ), it was great to round off the night with the chilled out vibes of Bessie Turner. There’s no denying she had an outstanding 2017, playing Latitude Festival and getting a ‘seal of approval’ from BBC Radio Goddess Jo Whiley. Although she already has some great tracks, Words You Say stood out as being the best, probably because I was excited to hear it live for the first time! Bessie and her backing band are embarking on an extensive tour in the next few months, check out her social media for all local and national dates! Congratulations to Organ Of Corti who go through to the BurySOUND final at The Apex on 9th March! NEXT HEAT: 2nd February at The Hunter Club. Kick off at 6pm, £5 a ticket!